La Paz is a happy, but noisy village. A little peace and quiet would make it just right. But there is one noisy rooster who doesn't give two mangos about this mayor's silly rules. Instead, he does what roosters were born to do. Carmen Deedy's masterfully crafted allegory and Eugene Yelchin's bright, whimsical mixed-media paintings celebrate the spirit of freedom -- and the courage of those who are born to sing at any cost. Beautiful Cockroach, which received a Pura Belpre Honor, and her New York Times bestseller 14 Cows for America. 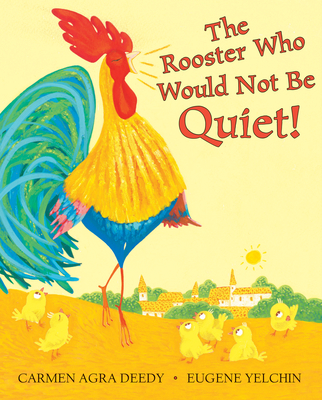 Born in Havana, Cuba, Carmen drew on her love of folklore to create The Noisy Little Rooster. She lives with her family in Atlanta, Georgia. Visit Carmen at www.carmenagradeedy.com. Eugene Yelchin loves to create books that explore the boundaries of universal truth. He is the author and illustrator of the Newbery Honor book Breaking Stalin’s Nose, as well as the illustrator of many distinguished, award-winning picture books. These include Won Ton: A Cat Tale Told in Haiku by Lee Wardlaw, and Elephant in the Dark, retold by Mina Javaherbin. Born in Russia, Eugene now lives in Topanga, California, with his wife and their two children. Visit him at www.eugeneyelchinbooks.com.